“Healthy activity” and “made-from-scratch meals” are more than just buzzwords for CoreLife Eatery—they’re foundational pillars, as much a part of the brand’s DNA as greens, grains and bone broth. Is it any wonder these concepts apply to the restaurant franchise’s social media strategy as well? Robust outreach and local engagement on social have helped the fast casual chain grow from a single location in Syracuse, New York to 30 locations and counting across the country. Aided every step of the way by digital marketing agency Site-Seeker, Inc., along with a hearty helping of Sprout Social and Simply Measured, CoreLife Eatery has racked up millions of impressions and engagements across its social profiles since March 2015. And further growth is on the menu. 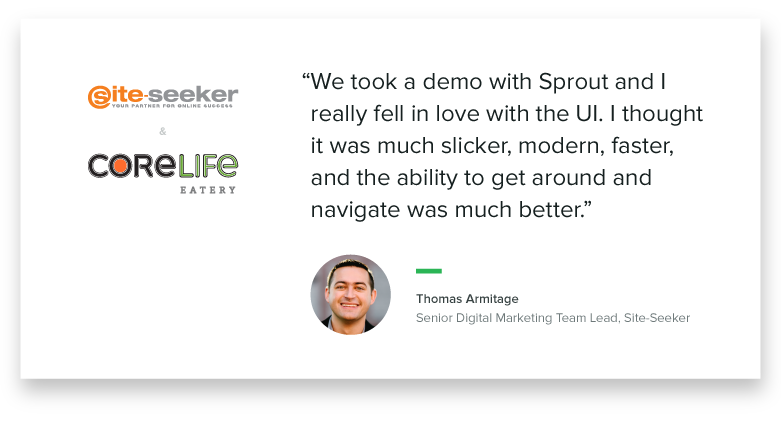 Thomas Armitage, Senior Digital Marketing Team Lead at Site-Seeker, was a Sprout fan long before he helped CoreLife Eatery launch its first location. Getting the team more familiar with Sprout was one of Armitage’s first recommendations upon starting at Site-Seeker in 2013. Meanwhile, he was introduced to Simply Measured in his capacity as an Adjunct Lecturer of Public Relations at Utica College. One of the assignments he gave his students was to learn about a social media tool and present it to the class. Expansion is a primary focus for CoreLife Eatery, so Site-Seeker set out to craft a social strategy that could be replicated across different store locations. Each new restaurant location is awarded its own localized Facebook page so tight-knit communities can be built around the pages and their content. Site-Seeker used Sprout to promote those new restaurants through exclusive VIP events, targeting the audiences that would be most interested in healthy eating options and fresh, made-from-scratch meals. That’s followed by grand opening promotions on social, supplemented with content that tells the story of the CoreLife Eatery brand, in addition to highly targeted social advertising. 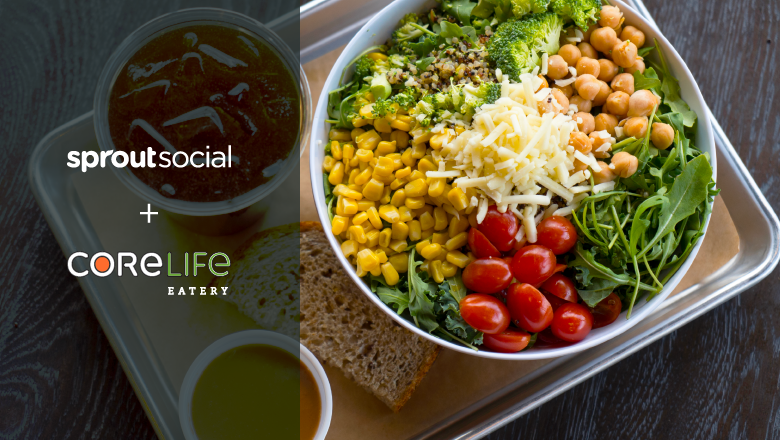 After locations are up and running, the Site-Seeker social team uses Sprout’s collaboration and user permission functions to share the reins with CoreLife Eatery’s in-house talent. 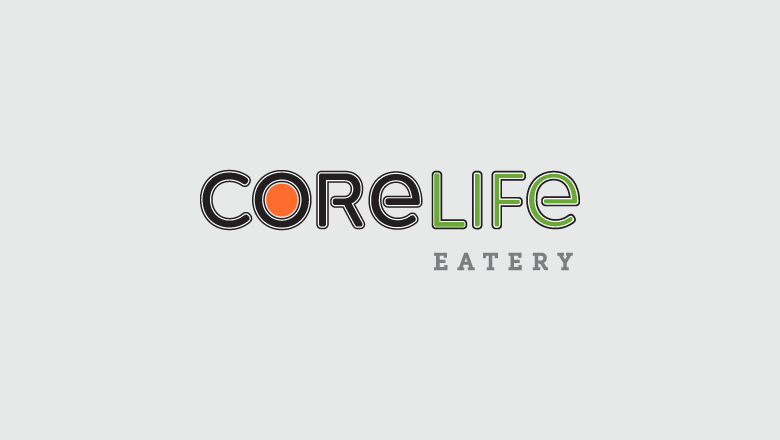 Sprout’s ability to provide autonomy to users without eliminating oversight has become even more important as CoreLife Eatery expands into franchising. Site-Seeker and CoreLife Eatery depend on Sprout first and foremost as a tool for organizing social efforts, from publishing to customer service to maintaining brand consistency across a continually growing portfolio of social profiles. Beyond the many Facebook pages, they also organize, schedule, publish and engage on Twitter, LinkedIn and Instagram—right within the same tool. However, when it comes to measuring performance across different profiles and locations, the team turns to Simply Measured. And what does Armitage and his team see when they analyze the numbers? 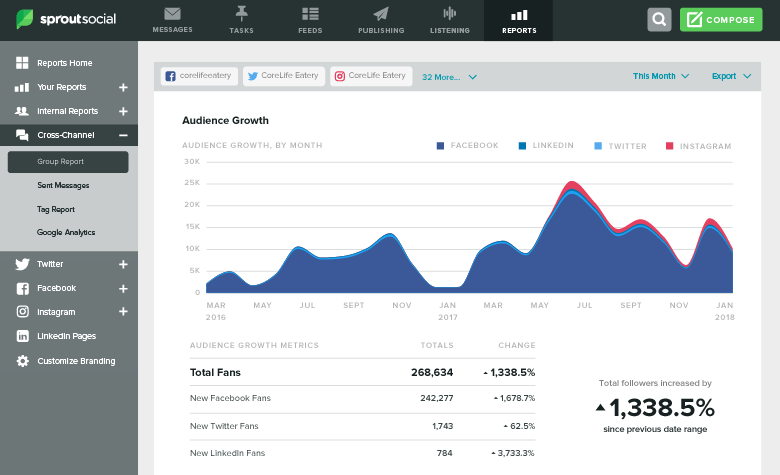 Consistent growth supported by Sprout Social and Simply Measured. Thirty locations later—with tweaking, testing and improving throughout—it’s clear the plan works. Through Sprout Social and Simply Measured, Site-Seeker and CoreLife Eatery continue to see rapid growth and off-the-chart metrics powered by a healthy social strategy.